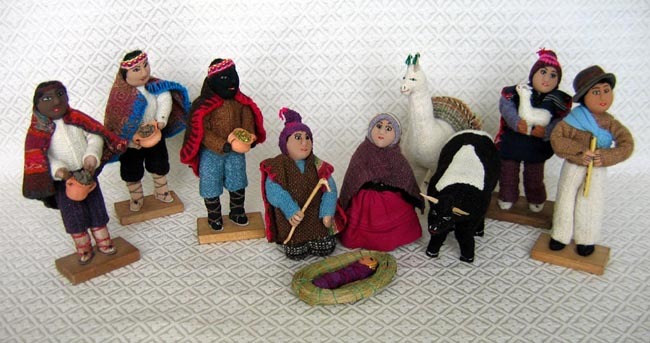 This Nativity from Bolivia is made from handspun, handwoven sheep’s wool that is dyed using natural pigments. The figures are fashioned after the traditional dress of Andean shepherds and Inca royalty. Mary and baby Jesus are depicted in traditional Aymara clothing. The 10-piece set includes Mary, Joseph, baby Jesus, two shepherds, a llama, a cow, and three wise men. The standing figures measure approximately 8 inches tall. Pastor Mendoza lives in a small community, a 2-hour walk from the village of Sorata. Over the past 20 years, he has concentrated on becoming a reliable and accomplished doll maker. His wife and 5 children also help in the making of the dolls and Nativities. In this way, his children grew up learning artisan techniques. Pastor’s community is very united, with each family focusing strongly on agricultural production. The main crop is corn, yet peas, beans, and potatoes are also popular crops. In Pastor’s community, the men take turns carrying out the responsibilities of leading the community. At the end of the year, the community responsibilities will be redistributed. Pastor doesn’t yet know what he will be asked to do for the coming year, or if he may have some time off from community duties. Until recently, Pastor’s village did not have electricity nor a road going to it. Those in the positions of responsibility in the community spent much time and energy in the official requests for these improvements, which have proven fruitful. It is now much easier to get produce to market using the new road. With electricity it is much easier for the children to do homework or the parents to do their handcrafts into the evening hours. Profits from the purchase of this Nativity help disadvantaged children in Bolivia, such as a hearing program that provides hearing aids and transportation to a special-needs school for children with hearing loss.